DNA rearbeam with integrated traveller, curved tillerbar and the innovative dyneeman/carbon/flexible resin glued-on trampoline. All images courtesy of Arno Terra . Check new Exploder T winglet designed by Gonzalo Redondo, remember my comments on the Kite foil design to step into the As? I have the previous version used in the Aus nats, and compared to the 2014/2015 standard naca winglets, the diff is huge in every aspect. I will post a pics later in the week comparing both winglets. Incredible to see the short traveller designed by Gonzalo & Jakub too, that Bundy will use, how about downwind if they have 5 knots? This shows lots of confidence and testing, we'll see how it goes i nsuper light weather. Check below a great preview by Arno, also watch his pics including Bundock's short traveller, but better read details directly on report. Last weekend the first sailors arrived in Medemblik and there was already a lot of action at the club on Monday and Tuesday. I did set-up my brand new D3 for Julio Saubidet who chartered my boat as I had too many work obligations to be fully present for two weeks myself. Last year Glenn and Mischa killed the fleet with the DNA. A lot has happened since that event; We saw the introduction of the DNA F1 and The Exploder D3. The topguns report upwind foiling now in anything over 12-13 kts. The new developments are in rudders, daggerboards and cases position, systems and aero package plus boomless decksweepers sails. In rudders we are seeing pretty wide T-foils with Moth style bulb and L rudders. 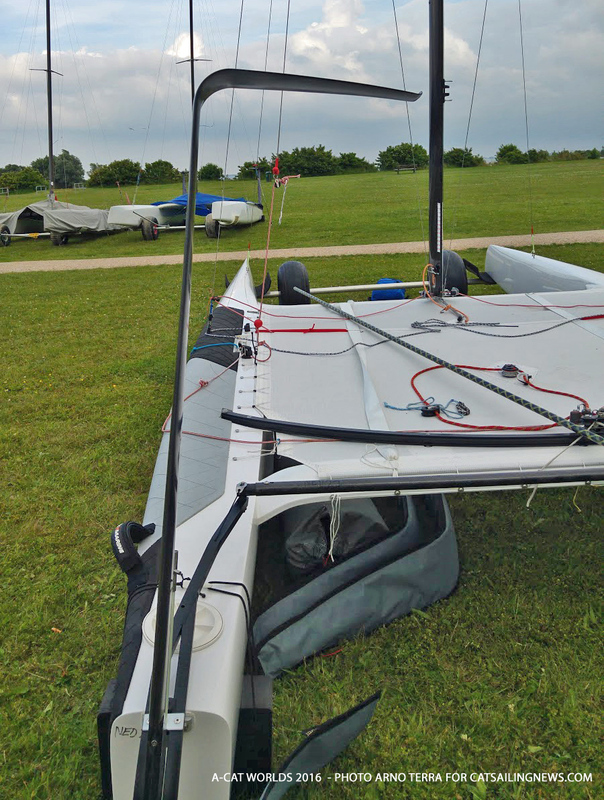 The Exploder rudder winglets are on the average a bit larger than the DNA L.
Although L rudders have theoretically less drag, some sailors still prefer the T winglets as the forces are more balanced and because these break less as it is harder for the builders to make a strong Ls. 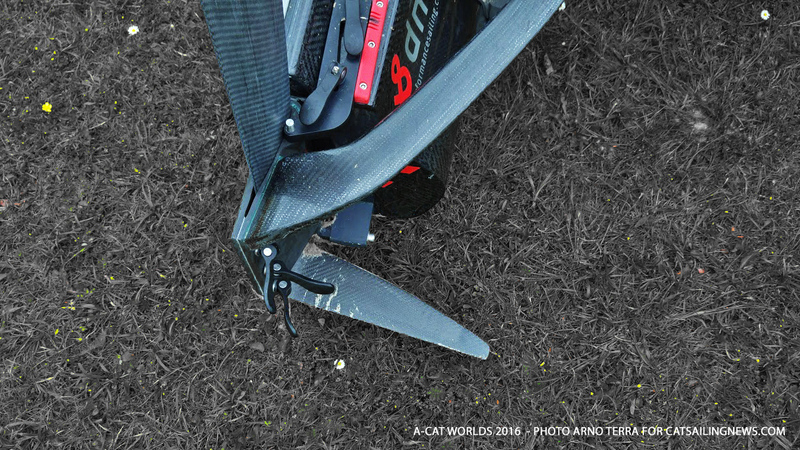 The new daggerboard case position (+20cm for the Exploder, and +20 cm more forward for the DNA) combined with the added lift on the new rudders foils has changed the characteristics of the boats dramatically. 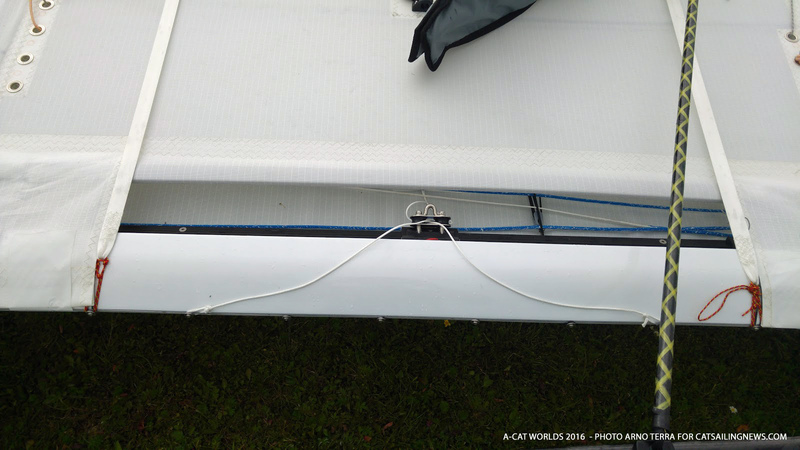 Sailors report earlier and easier foiling and a much improved acceleration. Bow down attitude all the time! The Exploder dagger boards have slightly more span and are larger overall area compared to DNA's steeper and smaller Z's. Systems are changing as well. Especially Darren and Carolijn work is hard to improve on the adjustment systems. Sailors need to flatter the sail more than before to reach higher end speeds, the sailors want to adjust systems while trapezing near the rear beam. The Exploder boards seem to need more adjustment than the DNA boards, which has both its advantages and disadvantages. 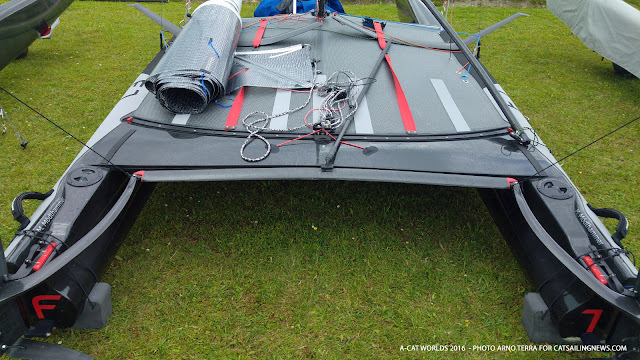 Darren, Carolijn and Stevie will sail with a super short traveller as they claim not to need the curved traveller anymore as they are flying all the time down wind. A short traveller with a boomless decksweepers is clearly a sign of less is more. Darren and Carolijn even use a very short mastrotator to reduce aerodrag. One big visual change is the shape of the front beam. Exploder has straight beams now, where last year the boat had a pronounced curve. 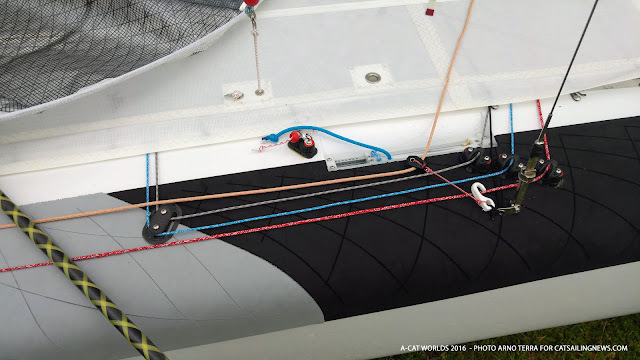 DNA uses a kinked beam with an endplate extender to improve flow over the deck. In waves the front beam of the Exploder may encounter same waves , but the package looks very low drag. The DNA beam has more clearance and has another design philosophy. 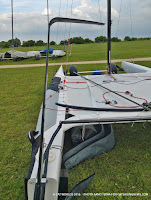 Having a kinked beam is an advantage while sailing with some heel, but it might increase lift from the trampoline too. Which one might not want in all circumstances. There is real chance we will see another epic battle this year. Although Glenn Ashby is not coming , Stevie Brewin is my favorite , Mischa is the man to beat in typical Dutch weather and both Darren and Tymek look strong contenders too. 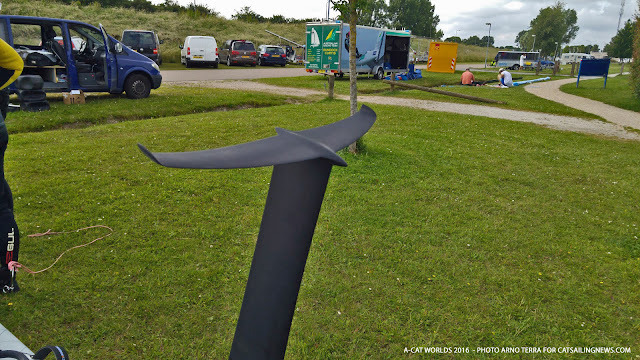 It will be interesting to see how the upwind foiling skills of the topguns have evolved and if one of the sailors can make the difference in the upwnd beat. Mischa might have an edge upwind due to his larger weight, which helps to get the boat on the foils earlier. What is clear here at Medemblik, is that the foiling technology has matured now. We will go back to more incremental change. I do not think that we will see many floating boats at the big championships after this Worlds. 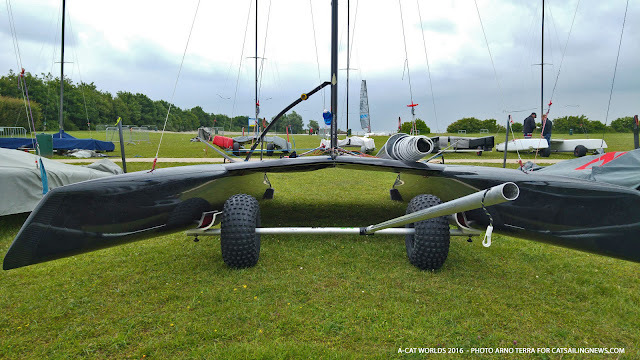 I hop we can keep the floaters and foilers in one fleet at the local regattas. On the pics above: It is not a great photo, but you can see how far the vertical of the Exploder board goes outward to extend effective span. Span is elongated effectively as the vertical has a symmetrical profile else it would not do anything.